Tensai Bakabon (天才バカボン, lit. "Genius Bakabon") is a manga and anime series created by Fujio Akatsuka which began publication on April 9, 1967, in Weekly Shōnen Magazine. It is about the misadventures of a dim-witted boy (Bakabon) and his idiotic father, the latter of whom eventually becomes the central character. The official English name was Meet the Boneheads, but has since been favored for the more accurate The Genius Bakabon. Bakabon's troublemaker father who eventually steals the show and becomes the central character. His catchphrase is saying "Kore de ii noda (これでいいのだ, It'll be all right)" to someone when trying to get them to go along with one of his stupid plans. A typical episode plot involves Papa either being too stupid to perform a simple task or coming up with some crazy idea to accomplish a simple task, usually asking for his son Bakabon's advice and causing tons of trouble. He was once very smart but became an idiot after an accident. He is known for always wearing his trademark hachimaki and haramaki. His favorite food is octopus. Papa has become an anime icon in Japan and was ranked number 9 in a 2002 TV Asahi Top 100 Anime Characters list. Voiced by Masashi Amenomori (1st-2nd series), Kōsei Tomita (3rd series, pachinko games), Hisahiro Ogura (4th series), Arata Furuta (5th series). A boy who enjoys causing mischief, especially with his Papa. On the inside, though, he is kind and works a part-time job as a shoeshine boy to buy his mother a birthday present. He is known for not wearing pants underneath his kimono. At the beginning of the series he attends Bōmō Eggplant Elementary School (坊毛茄子小学校, Bōmō Nasubi Shōgakkō), but by the fourth anime it has been renamed Bakada Elementary School (バカ田小学校, Bakada Shōgakkō). Voiced by Keiko Yamamoto (1st-2nd series, pachinko), Megumi Hayashibara (3rd series), Yoshiko Kamei (4th series), Miyu Irino (5th series). Bakabon's younger brother. He is a child prodigy, understanding words almost immediately after his birth and being capable of explaining the Pythagorean theorem and Kepler's laws of planetary motion. His name means "beginning". Voiced by Takako Sasuga (1st-2nd series, pachinko), Chika Sakamoto (3rd series), Yukiji (4th series), Ai Nonaka (5th series). Bakabon's mother and a graduate of Kuroyuri Women's University (黒百合女子大学, Kuroyuri Joshi Daigaku) (a parody of Shirayuri Women's University). Despite how much trouble and mischief Papa and Bakabon cause, she is a good wife and mother. She is the only family member to have the same voice actress throughout the series. Voiced by Eiko Masuyama (1st-4th series), Haruko Kitahama (1st series, Ep. 35 only), Noriko Hidaka (5th series). The Bakabon family's odd neighbor, named so for his tendency to say "rerere" (rather than are (あれ)) when confused about the countless shenanigans in the series. He is almost always seen sweeping the street outside of his yard. He is bald, has a moustache but no nose, ears that extend slightly off of his head, and wears a yukata and geta sandals. Voiced by Ryūji Saikachi (1st-2nd series), Shigeru Chiba (3rd-4th series, pachinko), Akira Ishida (5th series). The local beat cop, referred to as Honkan-san (本官さん, lit. "Mr. Policeman") in the anime. He is gluttonous, lecherous, and often fires his pistol at random. He is always wishing for money or a promotion. His notable features include his huge eyes usually drawn as connected into one eyeball, his underbite buck teeth (from the jawbone), and his one nostril in the middle of his nose. His official name from Akatsuka is Mentama Tsunagari Omawari-san (目ン玉つながりのおまわりさん, Officer with the Connected Eyes). Voiced by Isamu Tanonaka (1st series), Kaneta Kimotsuki (2nd series), Shigeru Chiba (3rd-4th series, pachinko), Toshiyuki Morikawa (5th anime). An unusual animal from the neighborhood who is a cross between an eel and a dog. Voiced by Michihiro Ikemizu (2nd series), Aruno Tahara (3rd series), Kōzō Shioya (4th series), Takahiro Sakurai (5th anime). A goofy dog who shows up during scene changes. Bakabon's classmate who always wears a helmet. For the 4th anime he was renamed Osamu Tezuka-buto (手塚ブト 治, Tezukabuto Osamu, "kabuto" means "helmet"). Voiced by Rica Matsumoto (3rd series), Kappei Yamaguchi (4th series). Bakabon's headmaster. Only appears in the first anime. Voiced by Kōichi Kitamura. Bakabon's ill-tempered classmate. Only appears in the first anime. Voiced by Kaneta Kimotsuki. Bakabon's girlfriend. Only appears in the first anime. Voiced by Kazuko Sawada. Originally from Osomatsu-kun, he only appears in the Rerere no Tensai Bakabon series alongside Iyami. Originally from Osomatsu-kun, he only appears in the Rerere no Tensai Bakabon series. 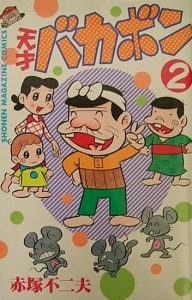 4 bilingual Japanese-English volumes have been released of the manga as The Genius Bakabon. Four anime series have been produced, with the first two series produced by Tokyo Movie Shinsha and the second two produced by Studio Pierrot. Tensai Bakabon (天才バカボン, "Genius Bakabon") aired for 40 episodes on Yomiuri TV from September 25, 1971, to June 24, 1972. Three years later, Ganso Tensai Bakabon (元祖天才バカボン, "Original Genius Bakabon") aired for 103 episodes on NTV from October 6, 1975, to September 26, 1977. ^ "大好きなアニメキャラベスト100 シネマでぽん！Ｓ cinema-game-toy/ウェブリブログ". Cinema-de-pon.at.webry.info. July 13, 2002. Retrieved October 30, 2013. ^ "Indiantelevision.com's Kidology: Hungama TV launches weekly primetime show 'Tensai Bakabon'". Indiantelevision.com. August 6, 2007. Retrieved October 30, 2013. ^ "Arata Furuta to star as Papa in "Shinya! Tensai Bakabon"". animatetimes.com. April 3, 2018. Retrieved April 2, 2018. ^ "Tensai Bakabon Family Comedy Manga Gets New TV Anime After 18 Years". Anime News Network. April 2, 2018. Retrieved April 2, 2018. ^ "New Tensai Bakabon Anime Premieres on July 10". Anime News Network. June 7, 2018. Retrieved June 7, 2018.